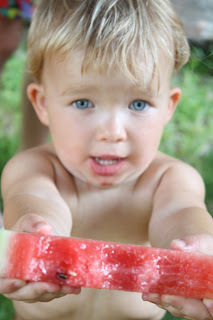 thankful house: Share my watermelon? I haven't written in a long time. Honestly, because I haven't had time when my children are working and I'm sitting at the computer. We've been at the pool, at the park, and at school working to be ready for fall time. During the school year, I often have twenty minutes, because it takes twenty minutes for Ada Bee to finish a chapter/a worksheet/etc. Well, in the summer, we're all running/lazing about/playing together. There is an elaborate tent fort in the hallway and I'm pretending not to be a mother to any of them. Except when they come ask for various accoutrements to make the tent fort even better. Then I get to pick one of the roles - of either being super fun and offering to accommodate or of being super unfun and refusing to participate and really, when it comes down to it, banning their participation. I'm learning, ever so gradually, to work against my nature and go with option number one. We're pro fun around here, but, problematically, often we are pro what we, as grownups, think should be fun for the little people. But we are not they. They are not we. Just as I'd always pick going dancing, but Paul would pick a movie, they don't think Uno is the best way to spend an afternoon. They prefer tent forts and other messy things. Again, I'm faced with two options. No, they shant destroy my house. Well, they do, of course. But I'm not just resigning myself to live in milk splatters, stray legos, and jam residue for the rest of my days. But, I need to allow more blanket forts. Can't they just read to one another? Play chess? (Even that ends up with pawns under my bed or in my ear or some such). Basically, that's all of life. Me or them? Caramelized Onion Quiche or Cheese Ravioli? Bike Rides or Glass of Wine in the Air Conditioning? Peanut Butter or, well, anythingbutpeanutbutter. It is an apparent juxtaposition. Here, Daddy, Want a bite of my watermelon? I have to admit... I'm not inclined to offer my children a bite of my watermelon. But they will share with me their very last crumb. My mother passed on what she maintains was the best parenting advice she received when I was born. I quote it to some new or old mother or father or stranger on the street about once a week. And, I'll maintain that, for most people, it's something they need to remember more often than forget. But I'm about to put it down, let it go, place it on the shelf, shove it to the side. A nurse told my Mama, "This baby did not come into the world for you to revolve around her. You've been here a lot longer, and she can just adjust to your world." It's true. They're little. For the first few months, they don't know they exist. And for a long time after that, they have no idea that they have rights, and for an even longer time after that, they've no memory. And, of course, for years and years and years, after that, they've very little wisdom. So, they can hush up. They can get a life. They can get over it. Catering to them only spoils them and makes you miserable. However, I can also hush up. I shouldn't bend my every facet to meet their every whim (which was the nurse's point, and remains quite valid). But, I should also not expect that of them. And that is what I tend toward. I tend to believe myself the superior in the relationship, and I appropriate that superiority a little much in the "my wishes are more valid than yours" department. Mine do have memories now. They also have opinions on things indifferent. And on things indifferent, really, their opinions are often just as valid as mine. Why should chess be better than a blanket fort? Reading better than drawing? Inside better than outside? If they want to sweat, clean up a blanket fort, and relish in colored pencils, who am I to fuss? So, I'm putting down the greatest parenting advice of all time. At least for a spell. I am here to serve them, after all; to serve them as Christian brothers and sisters. Often, the way I serve is through discipline and guidance. But, sometimes, the way I need to serve is to get on the floor in the blanket fort, and, in the sentiments of Clark W. Griswold, "Have a good time, dammit."